Michigan has stopped funding The Michigan CAP (College Access Portal) which previously served as the state’s one stop shopping center for college. Families will now want to start with the Michigan Association of Collegiate Registrars & Admissions Officers. This site has a list of all Michigan colleges with online applications. It also has a calendar listing College Day/Nights and Transfer Student Fairs. The organization also sponsors the Michigan Transfer Network which allows students to see which courses from which colleges will transfer to which colleges. The system includes both private and public institutions. The Michigan Student Aid website is worth a visit. It contains the Michigan Postsecondary Handbook in PDF format, produced by the state, which contains information on admission requirements, campus characteristics, program offerings, and application procedures for each college and university in Michigan. There is also a shorter 20 page Guide on Affording College in Michigan that includes the usual college planning information, checklists, and resources. There are 48 four-year Michigan colleges with 500 or more full-time undergraduates according to the Integrated Post-secondary Education Data System. A little over 23 percent of students attend one of the 33 private colleges while approximately 77 percent of students attend one of the 15 state institutions. 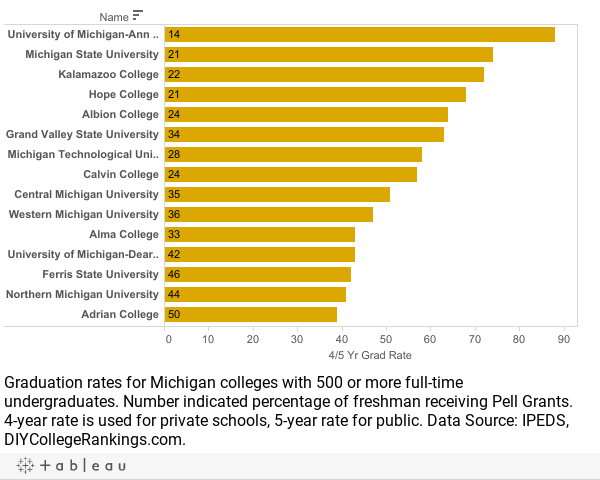 The private Michigan colleges have an average four-year graduation rate of 22.6 percent (if you remove Baker Colleges it increases to 31 percent) while the four-year state schools have a five-year rate of 46 percent. Only eight colleges meet the 50-50 DIY College Rankings Profile requirements. In Michigan the average Composite ACT score was 20.1. The English scores was 19.4 and the Math score was 19.9. The 75th% Composite score was 24, English was 24, and Math was 24. A total of 33 colleges ACT 75th% Composite scores were at or above this level.